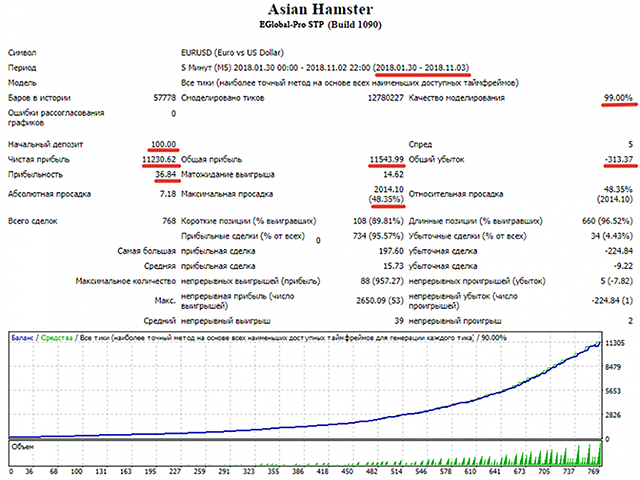 Asian Hamster is an expert Advisor for auto trading on EURUSD, which uses the two strategies: night of scalper and grid recovery drawdown. It can work with small deposits of $100. To enter the market uses filters of three indicators, two signal and one corrective, which gives confirmation to enter the market on a different timeframe. Working time: 2-3 hours in Asian session. There is a filter to limit trading during the news release. The EA works with two take profit and stop loss levels: virtual and real. Moreover, the virtual stop loss can be both static and dynamically changing, depending on the volatility of the market(higher volatility further SL from the price). The EA provides an opportunity to keep a part of the Deposit in reserve and use the remaining part of the reserve funds for trading, but all funds will participate in the drawdown. The chart has a panel to change some basic settings of the EA without reloading it. It is recommended to use only ECN or STP accounts with narrow spreads and market execution. It is better to trade on a VPS with a low ping to the broker, the less the better. To use the parameter Disable trading during news release (news filter), you need to open the menu item "Tools" - "Settings" - "Expert Advisors" in the terminal, tick "Allow WebRequest for the following URL:" and add the following address: "http://cdn-nfs.faireconomy.media/". Then click "OK". News for the filter will be loaded from this site. I have bought this EA two months ago, being testing and went live with one account. Very happy with results but i don´t just leave him there alone, i always keep an eye on the trades specially in the morning. Use several pairs and until now it´s working fine. I think if someone is not greedy can get good results from this EA. I traded this for two months on a live account. My conclusion is it can make you money in the short term, it will lose you money in the long term. I was fortunate to have my VPS crash on one of the days it had its big draw down. I then put in on hold and avoided a couple of the other blips. Ultimately it's a game of chance and you will eventually get yourself in a position where you suffer significant losses which can't easily be rectified. I was also disappointed that the original signal in Oleg's profile was deleted when it tanked. It's now been reset with one which only shows gain. Ultimately, it isn't a scam it's just an EA that will eventually lead you to lose money. Ist eine sehr gut EA.Machen Sie weiter so. This is the great EA that I'm using for trading. Oleg always listens to what consumers want & keep the EA updating. Keep it up Oleg. PS: Just combine with fundamental & analysis knowledge. and you will get a great result. Nice Expert. More user friendly comparison the other EA. It gives you good information about Money Management and your lot size. Of course with good setting and supervising can make good profit. Developer is definitely a 5 star due to his commitment and responsiveness. However its hamster logic that i dislike. A scalping tactic in my opinion shouldn't be held overnight and yet have a high DD(default settings). Great that the EA is also flexible to allow me to adjust my risk. Очень неудобный советник! Невозможно отключить навязчивую панель управления на графике. У вас не получится просто загрузить сет и работать, приходится постоянно переносить настройки на панель. Которая большинству нафиг не нужна. Автор постоянно делает обновления советника. Казалось бы хорошо, но нет! Настройки при обновлении постоянно слетают и опять надо терять много времени, перенося настройки на надоевшую ненужную панель. Зачем так усложнять? Greatest product I found on mql5. This EA has many potentials to discover. you can change the parameters to make it more powerful not even in Asian session but on the whole day. Oleg is really professional and Asian Hamster is a great EA. Like all EAs it is not infallible but with the right settings it can give good satisfaction. Советник каждую пятницу закрывает ордена не по Т\Р а в +1 пункт, соответственно комиссия съедает всю прибыль. Сегодняшняя неделя 04,02,19-08,02,19 показала, что советник не способен справляться с просадками. 1 звезду ставлю только за общительность автора. Сегодня 8 февраля 2019 года и я потерял 50 % депозита. Советник закрылся с убытком в половину депозита. Firstly, I have to say that the support is very well done. Along with the details of the EA, very clear on the MT4 platforms. Beside, EA showed very good result in last 2 weeks. There is a long way to go to confirm everything but I'm happy with both EA and the owner. Asian Hamster EURUSD,M5: EA Asian Hamster EURUSD Error Trade is prohibited when opening an order Price=1.14265It's useless to keep prompting like this. пусть некоторые и говорят, что это типо копия совы рамиля, это не так. Олег ушёл дальше с этой совой! тут намного продвинутая система! He copied the Hamster by Ramil. I am in Hong Kong and have no affiliation with Ramil. You shouldn’t copy others things. Отличный советник! И поддержка на высоте. Excellent EA! Profits over and over in my demo account with default settings. I will go live soon, 2nd week of Jan 2019. I will be updating. I bought Cypress yesterday so i will be posting a review about it as well. Take a look at Hyperboloid, Thats my favourite. These are all Oleg EAs, thanks a million Oleg! Всем привет ! Я из России ! Присоединяюсь к большинству положительных отзывов ! Отличный хомяк ! Те кто - пишут плохие отзывы - "просто не разобрались" как его правильно использовать,нюансы есть (какой брокер,время правильно выставить !) Автор замечу грамотный и всегда помогает ! P.S. Этот хомяк отличается в гораздо лучшую сторону - "от хомяка Рамиля" ! Однозначно рекомендую именно этого хомяка ! I am using FBS broker and FBS had GMT +2 timing on MT4 platform. Please advise should I change in your EA default GMT setting +2 instead of +1 (by default)? Good EA and good programmer, he's attentive to the community. The strategy, like those of this type, has its risks but if it is managed without greed it has a good level of success. Only two days in real account and only profits, better than any Hamster there is out there. Oleg is very helpfull and professional. One of the best risk reward ea, with proper risk & money management this ea will make great profits. Thanks Oleg for the support. Perfect Ea with Good price and excellent result on backtest. the ea has SL and TP which most of experts in this market dont have. it's realy profitable. i recommand it highly. Thank you Oleg Pavlenko For your Expert and your Support. Awesome EA and Excellent customer support. You can definitely make money with proper money management. Thanks to Oleg for such wonder EA with very reasonable price. Installed Asian Hamster and first night trades were good. I did set the spread to 1.5 pips, simply because I have a 5K account to work with. Oleg communications are really good and helpful. So far I recommend trying this one as it shows great promise. EA is quite stable. In less than a week's working time, about 10 transactions were completed, providing about 10% profit without any loss. The author is very responsible and diligent, and full of love for his works. I hope he can keep updating and make EA better and better. I will continue to test and pay attention to updates, and post the latest profit comments from time to time. 2. Added the Use Settings on the Chart parameter. If Use Settings on the Chart=False, the EA will use parameters from the standard settings window. However, the ability to change parameters directly on the chart will remain. 3. Changed address to receive news on. Change in the terminal settings, in tab "expert Advisors" address "http://forexfactory.com" address "http://cdn-nfs.faireconomy.media"
1. By popular demand, the "Close All after (-1 not use)" parameter has been added. If you set the value of the parameter, for example = 10, then after 10:00 at the broker's time all open positions will be closed, regardless of whether they are profitable or with a loss. 2. Added "Invert BUY with SELL" parameter which allows to open SELL orders instead of BUY orders and vice versa. 3. By popular demand, some parameters from the "CONFIGURE INDICATORS" section are placed on the "MAIN SETTINGS" panel on the chart. BEFORE YOU UPGRADE SAVE YOUR SETTINGS AND LOAD THEM AFTER THE UPGRADE EA. 1. Added the option Use BE on Friday - to use or not to use the close to breakeven on Fridays. Disabled by default. 2. Added automatic detection of deviation from GMT of your broker. The current Greenwich mean time is displayed on the chart and GMT of the broker is automatically set to the Time Zone, GMT (for news) parameter. Attention! 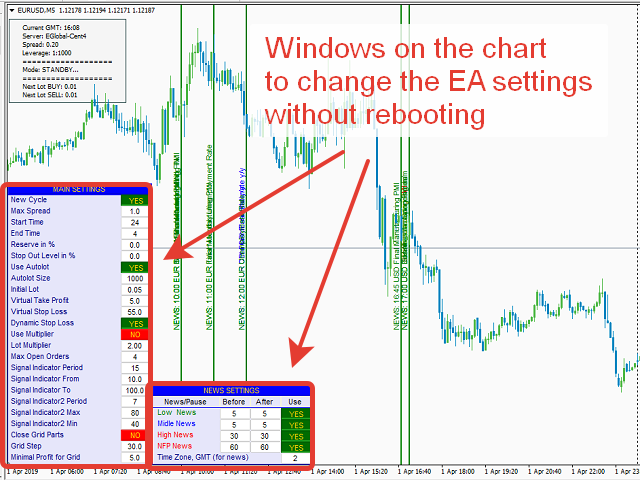 TO DETERMINE THE CORRECT GMT BROKER, YOU NEED TO INSTALL THE EA ON THE CHART ONLY WHEN THE MARKET IS OPEN! OTHERWISE, SET THIS PARAMETER YOU HAVE TO MANUALLY. 3. The principle of operation with the input parameters of the EA has been changed. Now any parameters can be changed both in the normal parameters window (hotkey F7) and on the chart in the MAIN SETTINGS and NEWS SETTINGS Windows without restarting the EA. 4. Some input parameters of the EA have been changed. 1. The algorithm of closing orders on Fridays has been changed, due to the fact that some brokers closed orders earlier than it was set in the at BE on Friday after parameter. 1. Attention! BEFORE THE UPGRADE ADVISOR WILL SAVE YOUR SETTINGS IN THE SET FILE. 2. Attention! AFTER the UPGRADE ADVISER,you WILL NEED to DELETE the FILE "AH_Settings_EURUSD.cfg "from FOLDER"...\MQL4\Files\" of YOUR TERMINAL, AND THEN LOAD IN the EA SAVED SETH. 2. ATTENTION! AFTER the UPGRADE ADVISER,you WILL NEED to DELETE THE FILE "AH_Settings_EURUSD.cfg" FROM FOLDER"...\MQL4\Files\" OF YOUR TERMINAL, AND THEN LOAD IN THE EA THE SAVED SET FILE. 3. Added check of At BE on Friday after parameter for correctness of the value. If the parameter is written incorrectly by the user, an alert with the instruction will be issued. 4. Fixed some minor bugs in the EA code for optimization purposes. 1. Changed the algorithm of the Reserve % function. Now, if you specify the value 75 in the Reserve % parameter, the EA will work according to the 1/4 by 3/4 capital management strategy and you will not need an additional account as a wallet. 2. Added the Stop Out Level % parameter (0.00 - not use) - If the value is greater than zero, the EA will close all positions when the percentage of free funds that the EA uses in trading becomes less than this value. For example: on a Deposit of$ 1000, in reserve left 75%. So the EA has$250 left to trade. If you specify Stop Out Level % (0.00 - not use) = 5.0 in the parameter, the EA will close all positions (5*250/100 = 12.50) when$ 250 is left. That is, in fact, orders will be closed when the amount on the account reaches 750+12.50 = 762.50$. This will not increase the drawdown and protect the Deposit from a complete drain. 3. Added the use Order Comment parameter. If this parameter is set to False, the EA will open orders without comments. This will allow you to hide them from the broker. 4. Fixed some minor bugs in the design and optimized the EA code. 2. Added various checks on the ban or permission, such as trading on the symbol, opening BUY or SELL, etc. 3. The EA code is slightly optimized. 1. Added automatic transition to http if your server is blocked 443 port and WebRequest Protocol https does not work. 1. Added the parameter Use Average TP SL=FALSE - if FALSE, the EA will not average stop loss and take profit levels and each order will have its own level, if TRUE, the levels will be averaged and for all orders there will be one stop loss and take profit level. This will allow you to close some orders at the real take profit level, if you set it to 1-2 points more than the virtual profit level. It is recommended to use together with enabling Use Lot Multiplier=TRUE however, the maximum number of orders(Max Open Orders), in this case, should be reduced to a maximum of 4 orders. 2. Attention! The address of the site from which the news for the news filter will be loaded has been changed. 1. For the strategy tester, the parameters now change as usual in the EA settings window. To test the EA in visual mode, the parameters can also be changed directly during the testing in the "MAIN SETTINGS" panel on the chart. At the end of testing, the service file with settings is deleted automatically. 2. If you disable the "Show Info Table" parameter, only the "MAIN SETTINGS" panel will remain on the chart, other information panels will not be displayed. 3. Optimized the EA code to speed up testing in non-visual mode. 4. The default settings for GMT+1 loaded settings from the previously proposed set file.